Although this recipe has 3 different steps, spaced about 30 minutes apart, I didn't feel it was an all day thing (which if you know me, I generally don't do!) This was easy to make and do the next layer in between other household tasks, so I felt is was worth it! Plus I LOVE that it can be made the day before! Jan's Tip: If you are making the Sugar Free Version: There is naturally occuring fructose in the fruit, but no added sugar. Fructose does not spike your blood sugars quite the way refined sugar does, so it is easy to fit this one into their meal, just let them know about the fruit! *Dissolve: orange Jello in 1/2 cup boiling water in a small bowl, and set aside 10 minutes. *Place oranges, 1 cup evaporated milk , &amp; the jello in a blender &amp; puree 10 seconds or until well blended. *Pour puree into loaf pan. *Refrigerate 30 minutes or until set. 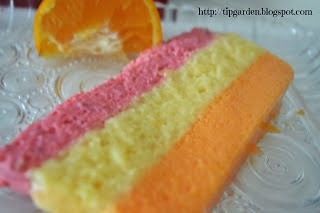 Repeat process step by step exactly as you did for orange layer substituting lemon Jello and drained, crushed pineapple. Pour Puree over the orange layer. Refrigerate 30 minutes or until set. Repeat process step by step exactly as you did the previous two layers substituting strawberry Jello&amp; thawed strawberries. Run point of a knife around edges of pan (just along the top is fine). Dip pan into a large pan of warm water for 15-20 seconds. Place serving platter upside down on top of pan. Flip the pan and platter together.